Your evergreen content will be sourced from your own media — primarily your website and blog — and you can continue to put it in rotation. Of course, your tweets will need to differ, and the structure of that messaging may change, but the landing page or content will remain the same. You can use evergreen content at any point in time, so it can very quickly fill holes in your editorial calendar. While some evergreen content directs users to your website and branded content, it’s not overtly promotional. Millennials reject aggressive sales techniques on social media. They are, however, somewhat more accepting of broadcast content designed to drive traffic to your website or push a particular product or service on Twitter. Develop some soft sell content that you can use to promote your brand, but remember that this content is merely tolerated, not enjoyed. Here, you can see an example of a promotional tweet that isn’t particularly aggressive. Develop content that fits this mold and use it sparingly. 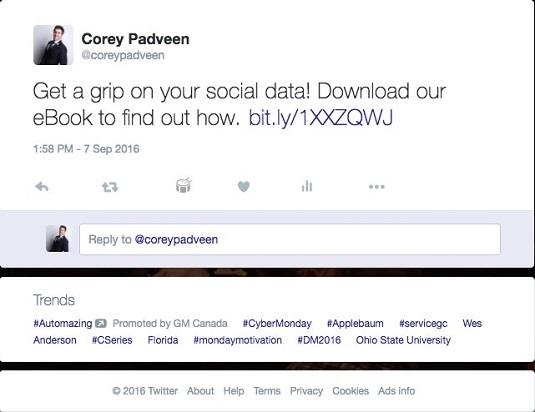 An example of promotional content on Twitter. The last type of content you need to develop won’t be content at all. It will be a Twitter list. This list will contain the primary accounts from which you’ll pull content to retweet, reply to, or mention. Of course, you’ll add other accounts over time, but developing a preliminary list of accounts that share great content is a great way to simplify the process. To create a list on Twitter, click on the profile picture icon and choose Lists from the menu. Then select the option to create a new list and name your list something along the lines of Third Party Content Providers. Then, when an account is found that may fit into this list, select the small gear icon on the user’s profile and choose to add the user to your new list. Adding a user to a list on Twitter.